Katie Mercer, mother of three, Madeleine Jones, perplexed by the unusual phenomenon, which recorded her daughter, then shot himself on video in the mobile application Snapchat (Snapchat). In the video the girl is like talking with someone and playing some word game. The girl, whose face thrown filter "harlequin" carefully enunciating the words "Cheeky... little...", and this was followed by a dull masculine voice coming from nowhere, says "Monkey". "Monkey" repeats the voice, a girl. According to the mother girls in the apartment this time there were no men and Madeleine made this video, she immediately showed it to mom. And when Katie heard a man's voice. speaking the word "Monkey", she immediately recognized him as his father Peter Mercer — grandfather of Madeleine. Peter died of cancer of the throat in 2016 at the age of 63 years, and before that he was called Peter pan because of the fun nature and habits to the childish. Peter adored his granddaughter Madeleine, although when he died, she was only 5 months and she hardly remembers. 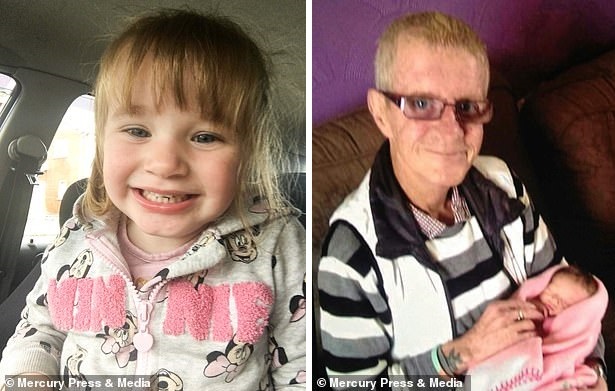 Peter Mercer with his granddaughter (left) And this video is not the only evidence that little Madeleine communicates with his dead grandfather. According to her mother, Madeleine often likes to sit alone on the carpet in her room and someone to talk to. And when Katie asked who she talks to, the girl replied that she was "playing with grandpa". "In this video, she only used an external filter of "harlequin", there were no filters for extraneous voices," says Cathy Mercer, — "And the male voice sounds so barely noticeable that I fully hear him, only when he watched the video for the fifth time. When I clearly heard the word "Monkey", I was scared. But now, though I'm sure it's weird, but I believe that it is the voice of my father." According to Katie, her daughter had also told her about the Ghost who "lives in the house." And that it's not like those games with imaginary friends that there are many children her age. "He truly loved my daughter and immediately took her in his arms when I brought her home from the hospital. Everyone called him "Papa Peter pan", he was so young at heart," continues Katie. Some people are critical of this video. According to them, the voice of a man or specifically imposed over the video, or is it just crashing. But Kathy says that she now believes in the paranormal.